Aside from pork, the most expensive and very popular meat in the Philippines are beef. 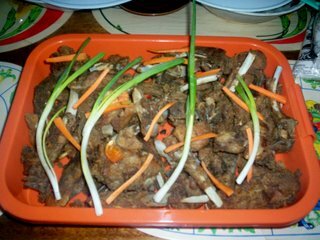 We Filipinos loves to cook beef during fiesta, wedding, parties and also at home serve at the table during dinner. One of my favorite beef recipe is beefsteak. It is very common for us Filipino to cook beefsteak and I'd love to share the basic recipe of beefsteak. If you are interested to cook beefsteak just follow the basic ingredients and procedure and I'm sure you love to eat it. Combine the lemon juice, soy sauce, salt, sugar and water in a cup. Pour the mixture over the beef slices and marinate for at least 30 minutes. In a skillet, saute the onions in the oil until they are transparent. Add the beef and marinade liquid to the onions and stir - fry over high heat for 7 - 10 minutes. Add the cornstarch mixture to the liquid and cook, stirring for 3 to 3 minutes more. Serve with rice. kani maoy yummy kaau. fave na nako ang beef steak filipino style.Hmmmm....yummy kay dai! oi kalamia ba ani diri imong site oi.motambok pud kog balik ani da. nwys, psssttt ajaw saba ba kay la kabalo akong kapikas sa kinabuhi diring nga nagpadala ko.hehehe!ato ato lang na ba.